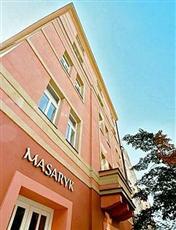 This hotel is located in Prague, and Prague State Opera, Czech National Museum, and Wenceslas Square are area attractions. Additional attractions include Vysehrad Castle. Recreational amenities include an indoor pool. This 4.0 star property offers secretarial services and business services. Wireless Internet access is available in public areas. The property offers an airport shuttle (surcharge). Guest parking is available for a surcharge. Additional property amenities include a library, multilingual staff, and laundry facilities. Furnishings include desks and sofa beds. At the 4.0 star property, accommodations include kitchens with microwaves, refrigerators, and coffee/tea makers. Bathrooms feature hair dryers. Guestrooms offer phones and CD players. Televisions have satellite channels and DVD players. Rooms also include separate sitting areas, minibars, and irons/ironing boards. Guests may request extra towels/bedding and wake up calls. Housekeeping is available.